Please Re-Upload and Share this Video with Everyone! More than a dozen U.S. states have now completely decriminalized the act of possessing marijuana and both Colorado and Washington have made it legal to possess, sell, transport and cultivate the plant. But soon it may be legalized across the entire country following a decision Thursday by the federal government. In a historic and significant moment in American history, last November, Colorado became the first US state to legalize marijuana for recreational use. The impact of the decision could soon ripple across the entire country with vast opportunities to educate millions on the top health benefits of marijuana. Consumption and sale of marijuana is still illegal in all other states, though some cities and towns have passed local laws decriminalizing it or making it a low priority for law enforcement officers. There are also movements in many states to legalize pot, including legalization bills introduced in many other states. Last Thursday, the Department of Justice announced that it would not prosecute marijuana crimes that were legal under state law, a move that could signal the end of the country’s longtime prohibition on pot is nearing. “It certainly appears to be potentially the beginning of the end,” said Paul Armantano, deputy director of the pot lobby group NORML. “This memo appears to be sending the message to states regarding marijuana prohibition that is a recognition that a majority of the public and in some states majority of lawmakers no longer want to continue down the road of illegal cannabis, and would rather experiment with different regulatory schemes of license and retail sale of cannabis,” Armantano said. In 2011 the federal government decreed that marijuana had no accepted medical use use and should remain classified as a highly dangerous drug like heroin. Accepting and promoting the powerful health benefits of marijuana would instantly cut huge profits geared towards cancer treatment and the U.S. would have to admit it imprisons the population for no cause. Nearly half of all drug arrests in the United States are for marijuana. “In both Colorado and Washington, legalization was done by citizens with no participation by elected representatives until they had to pass laws to comply with the initiative. In other initiative states I would expect such measures – I would expect a new one in California, for instance – and roughly half the states permit this and the rest don’t. “In the states that do have initiatives I expect efforts to get it on the ballot. The other half it will be much tougher. It’s hard to get elected representatives to do this,” Collins said. Armantano is more optimistic about the spread of legalized pot. He compared the DOJ’s announcement to the federal government’s actions toward the end of alcohol prohibition in America a century ago, when states decided to stop following the federal ban on alcohol sales and the federal government said it would not step in and prosecute crimes. “For first time we now have clear message from fed government saying they will not stand in way of states that wish to implement alternative regulatory schemes in lieu of federal prohibition,” Armantano said. In 2003, the U.S. Government as represented by the Department of Health and Human Services filed for, and was awarded a patent on cannabinoids. The reason? Because research into cannabinoids allowed pharmaceutical companies to acquire practical knowledge on one of the most powerful antioxidants and neuroprotectants known to the natural world. The U.S. Patent 6630507 was specifically initiated when researchers found that cannabinoids had specific antioxidant properties making them useful in the treatment and prophylaxis of wide variety of oxidation associated diseases, such as ischemic, age-related, inflammatory and autoimmune diseases. The cannabinoids are found to have particular application as neuroprotectants, for example in limiting neurological damage following ischemic insults, such as stroke and trauma, or in the treatment of neurodegenerative diseases, such as Alzheimer’s disease, Parkinson’s disease and HIV dementia. Nonpsychoactive cannabinoids, such as cannabidoil, are particularly advantageous to use because they avoid toxicity that is encountered with psychoactive cannabinoids at high doses useful in the method of the present invention. Besides the top 10 health benefits below, findings published in the journalPLoS ONE, researchers have now have now discovered that marijuana-like chemicals trigger receptors on human immune cells that can directly inhibit a type of human immuno-deficiency virus (HIV) found in late-stage AIDS. Cannabinoids, the active components of marijuana, inhibit tumor growth in laboratory animalsÃ‚Â and also kill cancer cells. Western governments have known this for a long time yet they continued to suppress the information so that cannabis prohibition and the profits generated by the drug industry proliferated. Scientists are now formally acknowledging something that Cannabis consumers have long taken for granted: aroma is associated with effect. Plant cannabinoids —21-carbon molecules found only in Cannabis— are odorless. It’s the terpenoids —components of the plant’s “essential oils”— that create the fragrance. Terpenoids contain repeating units of a 5-carbon molecule called isoprene and are prevalent in smelly herbs such as mints and sage, citrus peel, some flowers, aromatic barks and woods. The aroma of a given plant depends on which terpenoids predominate. They tend to be volatile molecules that readily evaporate, and they’re very potent —all it takes is a few reaching the nose to announce their presence. Evidence that “phytocannabinoid-terpenoid interactions” enhance the therapeutic effects of cannabis was presented by Ethan Russo, MD, at a conference in Israel in 2010 and published in the August 2011 British Journal of Pharmacology. Russo, a neurologist and ethnobotanist, is senior medical adviser at GW Pharmaceuticals. Both terpenoids and cannabinoids are secreted inside the Cannabis plant’s glandular trichomes, and they have a parent compound in common (geranyl pyrophosphate). More than 200 terpenoids have been identified in Cannabis. The most common and most studied include limonene, myrcene, alpha-pinene, linalool, beta-caryophyllene, caryophyllene oxide, nerolidol and phytol. Anecdotal evidence suggests that pinene is alerting, limonene “sunshine-y,” and myrcene sedating. The fact that most terpenoid compounds are common components of the human diet and “generally recognized as safe” by the Food and Drug Administration has made research possible, and scientists employed by flavor and fragrances manufacturers have investigated their properties over the years. But the terpenoids “remain understudied” in terms of therapeutic potential, according to Russo. His paper mustered all the evidence —proof in some cases, hints in others— that cannabinoids and terpenoids can work in concert to abate symptoms of pain, inflammation, depression, anxiety, addiction, epilepsy, cancer, fungal and bacterial infections, including methicillin-resistant Staphylococcus aureus (MRSA, which kills more Americans nowadays than AIDS) and other illnesses. Jeffrey Hergenrather, MD, president of the Society of Cannabis Clinicians, who heard Russo’s presentation in Israel, expects its publication to “generate great interest in terpenes among medical cannabis users as well as physicians.” The SCC recently began collecting data on patients’ responses to CBD-rich Cannabis. Future surveys will seek to document which other cannabinoids and which terpenoids are associated with which effects. The conference at which Russo presented his paper was held at Hebrew University, Jerusalem, where Raphael Mechoulam directs a lab, in honor of Mechoulam’s 80th birthday. In 1999 Mechoulam co-authored a paper with Shimon Ben-Shabat suggesting that cannabinoids made in the body work by means of an “entourage effect.” They had found that the endocannabinoid 2-AG (2-arachidonoylglycerol), when administered with two related compounds, would bind more readily at the cannabinoid receptors and exert more pronounced behavioral effect on mice. Some deep thinkers believe life is a paradox not to be understood but experienced to the fullest. However, the Sages have said, “Know thyself.” At any rate it is paradoxic to attempt simplifying the infinite complexity of flowing life. Yet, it is far better for the health and development of any thinking and feeling, uniquely individual human being, to pursue knowledge than to lounge in ignorance. One out of two Americans win die from the effects of cardiovascular disease (CVD). One out of four Americans will die from cancer. Researchers believe cancers erupt when immune system response is weakened. Pioneers in the fields of biochemistry and human nutrition now believe CVD and most cancers are really diseases of fatty degeneration caused by the continued over-consumption of saturated fats and refined vegetable oils that turn essential fatty acids into carcinogenic killers. And if this is not scary enough, more Americans are succumbing to immune deficiency diseases than ever before. Sadly it is ignorance of human nutritional needs that will cause this overwhelming majority of Americans to die slowly from these afflictions — the greatest killers in affluent nations. HEMP SEED PROTEINS AND THE BUILDING BLOCKS OF LIFE AND IMMUNITY There are eight amino acids the human body cannot make and two more the body cannot make in sufficient quantity, so they are essential to life. A diet without any one of them will eventually cause disease and death. These essential amino acids, along with eleven others the body can make from them, are chained together in accordance to genetic guidelines, via RNA formats from DNA blueprints, into structural proteins that give body to life, and into enzymes (globular proteins) that carry out the mechanics of living. Globulins are divided into three classes: alpha, beta and gamma globulins. Alpha and beta globulins operate as transport vehicles by combining with other substances and carry protein from one part of the body to another. They haul the materials needed to build new and replace worn or damaged bodily structures. 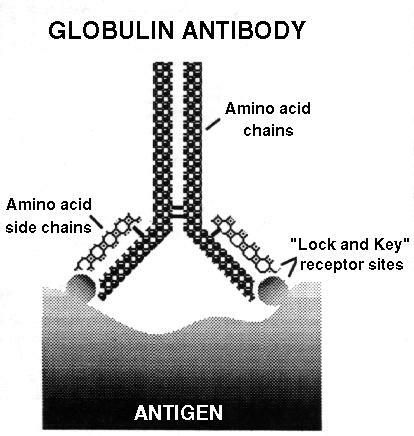 Gamma globulins are divided into five classes of antibodies called immunoglobulins. All are formed to combat specific cell invading antigens. They comprise the body’s first line of defense against disease and infection. Immunoglobulins are produced by B lymphocyte (white blood cells) plasma cell clones located in lymph system nodes. Infecting antigens normally must pass through the lymph system before entering the blood stream. Antibodies are globulin proteins programmed to destroy antigens (any substance eliciting a response from lymphocytes: bacteria, viruses, toxins, living and dead tissue, internal debris, etc.). Circulating in blood plasma like mines floating in a harbor antibodies await contact with the enemy, then initiate a cascade of corrosive enzymes that bore holes in the antigen surface causing it to break apart. Antibodies are custom designed to neutralize or disintegrate one specific type of antigen. White blood cells called B cell lymphocytes seek out and lock-on to antigenic proteins or sugars on the invader’s surface. The B cell then uses that lock and key pattern to make antibodies tailored to that antigen only. It also will make clones of itself called plasma cells. Most of the clones begin producing antibodies for that antigen. Others become memory cells which may spend years wandering through the blood stream looking for that specific antigen. If the body is exposed to it again the memory cells lock-on to one and begin producing plasma cell clones and a flood of antibodies that wipe out the invader. One lymphocyte can divide into hundreds of plasma cells in a few days. A mature plasma cell can make about 2000 antibodies every second for the few days it lives. This is how the body acquires immunity. The body’s ability to resist and recover from illness depends upon how rapidly it can produce massive amounts of antibodies to fend off the initial attack. If the globulin protein starting material is in short supply the army of antibodies may be too small to prevent the symptoms of sickness from setting in. Hemp seed is the premier plant-seed provider of globulin starting material — the highest in the plant kingdom. Eating hemp seeds will insure the immune system has the reservoir of immunoglobulin resources needed to make disease destroying antibodies. Blood: The River of Life, Jake Page; Dr. Robert A. Good, Dr. Lawrence S. Lessin, Dr. Kenneth C. Robbins, consultants. U.S. News Books 1981. Fats and Oils: The Complete Guide to Fats and Oils in Health and Nutrition, Udo Erasmus. Alive Books 1986. Life and Energy: An Exploration of the Physical and Chemical Basis of Modern Biology, Isaac Asimov. Avon Books 1962. Textbook of Medical Physiology, Arthur C. Guyton, MD. W. B. Sunders Company 1971. Textbook of Organic Chemistry, E. Wertheim. The Blakiston Company 1945.